© Carthagena et al. ; Licensee Bentham Open. Lactoferrin (LF), a multifunctional molecule present in human secretions, has potent inhibitory activities against human immunodeficiency virus (HIV). The aim of the study was to evaluate whether human LF (hLF) and its exposed domain LF-33 represented by the peptide (LF-33-GRRRRSVQWCAVSQPEATKCFQWQRNMRKVRGP) involved in LF-HIV gag binding and endotoxines neutralization, may inhibit early steps of HIV mucosal transmission. Human LF and the peptide LF-33 inhibited the attachment of primary X4-tropic HIV-1NDK and R5-tropic HIV-1JR-CSF strains to human endometrial (HEC-1) and colorectal (HT-29) CD4-negative epithelial cells, the purified hLF being more potent (up to 80%) than the LF-33 peptide. In addition, the hLF, but not the LF-33 peptide, inhibited up to 40% the transfer in trans of HIV-1JR-CSF and HIV-1NDK, from immature dendritic cells to CD4 T lymphocytes, likely in a DC-SIGN-dependent manner. Altogether, these findings demonstrate that hLF can interfere with HIV-1 mucosal transmission by blocking virus attachment to epithelial cells and by inhibiting virus transfer from dendritic cells to CD4 T cells, two crucial steps of HIV dissemination from mucosae to lymphoid tissue. Keywords: Lactoferrin, HIV-1, mucosal transmission..
Lactoferrin (LF) is a major iron-binding protein of innate immunity against microbial infections, abundantly present in mucosal secretions . An exposed site containing 33 residues (LF-33-GRRRRSVQWCAVSQPEATKCFQWQR NMRKVRGP) constitutes the glycosaminoglycans recognizing site of the human LF (hLF), whose first six N-terminus residues are critical for its anti-endotoxin activity . Human LF has also been shown to exhibit potent antiviral activity in vitro against a wide range of viruses, including human immunodeficiency virus type 1 (HIV-1) [3-5]. The inhibitory activities of hLF against HIV-1 take place in early steps of infection, probably during adsorption of the virus to target cells . The presence of two mutations in HIV-1 env gene in bovine LF-resistant HIV-1 variants further suggests that LF targets the HIV-1 entry process . Following sexual transmission, epithelial cells, immature dendritic cells (iDC) present in the mucosa tissue, together with CD4 T lymphocytes, are the first cells to encounter the virus . Infectious HIV-1 particles that are not sequestrated at apical surface of epithelial cells are captured by iDC and transported to the draining lymph nodes where the virus is efficiently transfered to CD4 T cells. In the initial phase, HIV-1 interacts with receptors expressed on iDC such as C-type lectin receptors (CLR). The dendritic cell-specific intercellular adhesion molecule-3-grabbing non-integrin (DC-SIGN) molecule plays a crucial role in binding HIV-1 through the gp120/41 envelope and in transmitting HIV-1 to target cells . Recently, we demonstrated that hLF limited specifically the adsorption of R5- and X4- tropic free HIV-1 particles on endometrial HEC-1 epithelial cells by inhibiting virus adsorption on heparin-sulfated proteoglycans . Furthermore, hLF was shown to strongly bind to DC-SIGN on dendritic cells, and prevent HIV-1 capture and transmission to CD4 T cells . The region of the hLF involved in these mechanisms remains still to be clarified. 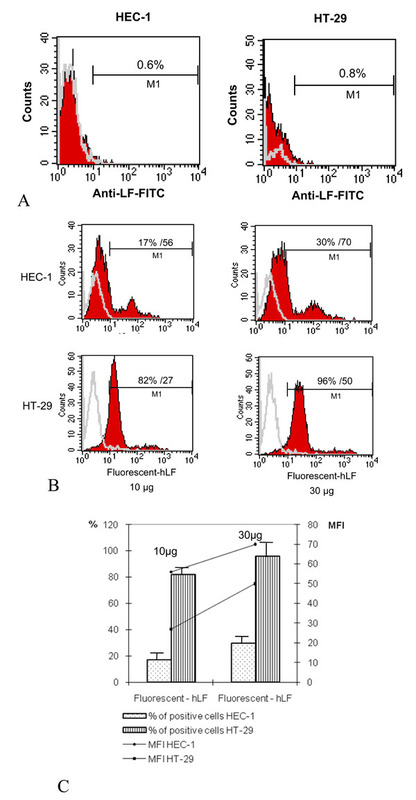 The aim of the present study was to evaluate whether hLF and its exposed domain LF-33 involved in LF-HIV gag binding and endotoxines neutralization, may inhibit early steps of HIV mucosal transmission, including HIV-1 attachment to epithelial and dendritic cells, and HIV-1 transfer from iDC to CD4 T lymphocytes. The hLF purified from human breastmilk was purchased from Sigma Aldrich (St Louis, Montana, USA); the Oregon Green 488 fluorescence conjugated lactoferrin from Molecular Probes (Oregon Green 488 fluorescence, Molecular probes, Belgium); the cytokines GM-CSF, IL-4, IL-2, the fluochrome-conjugated directed against CD4, CD1a, DC-SIGN, CD86, CD83, CXCR4 and CCR5, from R&D (R&D system, Oxon, UK) and BD Pharmingen (Le pont de Claix, France); the goat anti-rabbit-FITC from Jackson Immunoresearch, USA. The peptide LF-33 GRRRSVQWCAVSQPEATKCFQWQRNMRKVRGP was synthesized by Sequentia (SA, Evry, France). The [342-371]-DC-SIGN peptide YWNRGEPNNVGEEDCAEFSGN GWNDDKCNL, which corresponds to the carbohydrate recognition domain (CRD), was synthesized by Sigma Aldrich. Polyclonal anti-gp160 IgG were purified from a pool of sera sampled from HIV-1-infected patients (laboratoire de virologie, Hôpital Européen Georges Pompidou, Paris, France). The concentrations of hLF and LF-33 peptide in µg/ml correspond to 12.8 nM and 250 nM, respectively. The human colorectal epithelial cells line HT-29, and endometrial cells HEC-1A were provided by the American Type Culture Collection, Manassas, VA (ATCC HTB-38). Cells were grown in RPMI 1640 medium complemented with 10% fetal calf serum (FCS), penicillin (100 IU/ml) and streptomycin (100 µg/ml). The HT-29 cells were CD4-, DC-SIGN-, CXCR4high+, CCR5low+ and GalCerhigh+, and the HEC-1 cells were CD4-, DC-SIGN-, CXCR4high+, CCR5-, GalCer high+ (not shown). Choice of cells were an intestinal cell line (HT-29) and an endometrial cell line (HEC-1), corresponding to two mucosal tissue largely involved in HIV acquisition in exposed people (intestinal and genital mucosae). Peripheral blood mononuclear cells (PBMC) were isolated from cytapheresis of healthy adult donors by Ficoll density gradient centrifugation on medium for separate of lymphocytes (Eurobio, Courtaboeuf, France). Purification of monocytes was performed using the so-called “roseting” technic. In brief, PBMC (107/ml) were incubated for 20 min in ice with sheep erythrocytes treated with 2-aminoethylisothiouronium bromide (AET) (vol/vol), and subjected to a second Ficoll centrifugation. The iDC were obtained by culturing monocytes (106/ml) in RPMI 1640 in heat-inactivated human serum (10%) in plastic culture plates for 1 h at 37°C. After washing, mononuclear adherent cells were cultured for 6 days in RPMI 1640 containing 10% FCS, penicillin (100 IU/ml), streptomycin (100 µg/ml), and IL-4/GM-CSF (R&D Systems Europe, Abingdon, Oxon, UK) both at 10 ng/ml by changing medium every 48 h. Autologous lymphocytes (PBL) were obtained from the pellet of the second Ficoll centrifugation after lysis of sheep erythrocytes (5 min NH4Cl). After washing, PBL were cultured in the presence of IL-2 (10 ng/ml) and phytohemaglutinin (PHA; 2.5 µg/ml) for 48 h at 37°C, 5% CO2. After washing, an additional culture was carried out for 24 h in the presence of IL-2 (10 ng/ml). The purity of iDC and T cells was assessed by morphological criteria and flow cytometry analysis (iDC: 90% or more pure; CD4 T cells: 85% or more pure). Primary X4-tropic strain HIV-1NDK and R5-tropic strain HIV-1JR-CSF were a gift of Prof. F. Barré-Sinoussi (Institut Pasteur, Paris, France). The HIV-1NDK viral stock was obtained by growing virus in IL-2-activated lymphocytes of healthy donors. The R5-tropic HIV-1BaL and HIV-1JR-CSF were amplified in monocyte-derived macrophages cultures. Primary strains are thought to be representative of viral strains not adapted to their microcellular environment. In addition, both monocytotropic (R5-tropic) and lymphocytotropic (X4-tropic) HIV-1 strains are present in genital secretions, and may participate to HIV mucosal crossing in an exposed receptive individual. 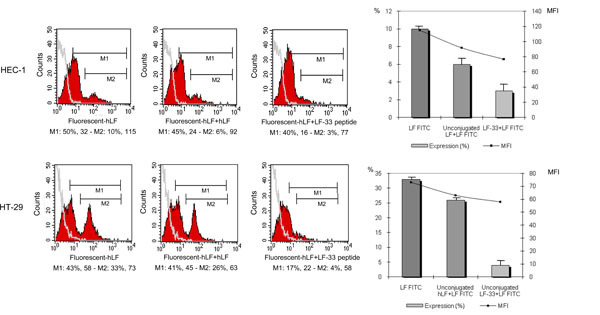 The constitutive expression of LF by epithelial cells used in all experiments and the binding of exogenous hLF were analysed by flow cytometry. Briefly, iDC, HEC-1 and HT-29 cells (106 cells) were incubated with polyclonal antibody to LF for 30 min at 4°C, and the expression of LF was assessed after fixation of cells with 1% paraformaldehyde (PFA), by FACSCalibur™ and the CELL QUEST™ software (Becton Dickinson, New Jersey, USA). To analyse the binding of hLF and LF-33 peptide to epithelial cells and iDC, 106 cells were incubated with the Oregon Green 488 fluorescence conjugated LF at 10 and 30 µg/ml for 1 h in ice. Cells were fixed with 1% PFA, and subjected to flow cytometry. In order to evaluate possible involvement of the LF-33 peptide in the attachment of hLF in some experiments, cells were pre-incubated with LF-33 peptide at 20 µg/ml before addition of stained hLF. To investigate the effect of LF-33 peptide and hLF on attachment of HIV-1 particles to epithelial cells, epithelial HT-29 and HEC-1 cells (106 cells/well) were incubated with various quantities of LF-33 peptide or hLF for 30 min at room temperature. Afterwards, viral particles from HIV-1BaL, HIV-1JR-CSF and HIV-1NDK strains (5 ng of p24 antigen) were added on epithelial cells, for 1 h at 37°C. After intensive washings (5-fold) with RPMI 1640, cells were lysed by addition of 1% Triton in PBS during 15 min at 37°C. Cell lysates were centrifuged, and the HIV-1 p24 antigen concentration was measured in the supernatant fractions by means of immunocapture enzyme-linked immunosorbent assay (HIV-1 core profile ELISA, DuPont de Nemours, Les Ulis, France). The interactions between the HIV-1 glycoprotein gp160, the DC-SIGN and the hLF or LF-33 peptide were analysed by ELISA. Briefly, a synthetic [342-371]-DC-SIGN peptide YWNRGEPNNVGEEDCAEFSGNGWNDDKCNL, corresponding to the CRD domain including the gp120 binding site, was adsorbed on plastic plate (10 µg/ml) for 18 h at 4°C. The wells were then satured with PBS/skimmed milk (1%) for 2 h at 37°C. After washing, the DC-SIGN peptide was incubated with hLF (100 µg/ml) for 18 h at 4°C. The fixed LF was detected using hLF-specific antibodies coupled to peroxydase (1 µg/ml) and streptavidin (1/100, Perkin Elmer, Boston, USA). The optical density was meseared at 590 nm before ortho-phenylene diamine (OPD) (Pierce, Rockforf, USA) addition. The immature phenotype of dendritic cells was checked before each experiment by flow cytometry for their expression of CD1a, CD83 and CD86, and of HIV-1 receptors and co-receptors (CD4, CCR5, CXCR4 and DC-SIGN), using FITC-conjugated anti-CCR5 and CD83 and PE-conjugated anti-CD4, CXCR4, DC-SIGN, CD1a and CD86 antibodies, for 30 min at 4°C. Cells (105 cells/ml) were washed in PBS/BSA (0.5%) and fixed in PFA (1%) before FACSCalibur™ and the CELL QUEST™ software analyses. Immature dendritic cells (105 cells per essay) were incubated with primary R5-tropic HIV-1JR-CSF and with X4-tropic HIV-1NDK (1 ng/ml of p24 antigen) for 1 h at 37°C. 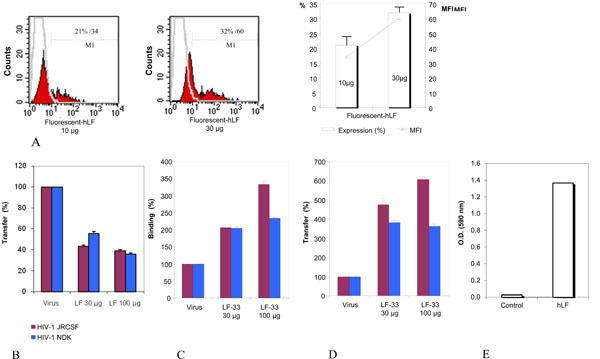 For inhibition experiments, cells were incubated with 30 and 100 µg of hLF and LF-33, respectively, before virus addition. Cells were then extensively washed, and the p24 antigen was measured by ELISA after Triton treatment of supernatants. Inhibition of HIV-1 transfer in trans to CD4 T lymphocytes by hLF and LF-33 peptide was investigated by incubation of cells with hLF and LF-33 before addition of virus. Cells were then washed, and IL-2- and PHA- activated autologous CD4 T lymphocytes (5x106 cells) were added, and the p24 antigen was measured at 3 days of co-culture. The non parametric Wilcoxon signed-rank and Friedman’s tests were used for statistical analyses. We investigated whether hLF and LF-33 peptide were capable to inhibit attachment of free R5-tropic HIV-1BaL and HIV-1JR-CSF, and X4-tropic HIV-1NDK strains to HT-29 and HEC-1 epithelial cells. We first determined the LF baseline expression by epithelial cells. A neglected percent of epithelial cells expressed hLF, 0.6 and 0.8%, respectively (Fig. 1A). Binding of hLF to epithelial HEC-1 and HT-29 cells. (A): Lack of constitutive expression of LF at cellular surface of epithelial cells. Cells were incubated with anti-lactoferrin for 30 min at 4°C, washed and incubated with Oregon-fluorescent-conjugated anti-rabbit for additional 30 min at 4°C. Cells were then fixed by PFA (1%) and analysed by FACScalibur analysis. One representative of 4 ruled out independent experiments is shown. (B): Human LF binds to HEC-1 and HT-29. Epithelial cells were incubated with fluorescent hLF at 10 and 30 µg (e.g. 128 and 384 nM) for 1 h at 4°C, fixed and analysed by FACScalibur. The corresponding percentages of positive cells and mean fluorescences are mentioned in the correspond quadrant. Data are from a typical experiment representative of four independent experiments. (C): The mean ± SD of LF positive cells and corresponding mean MFI calculated from 4 experiments is presented. Competition of hLF binding to epithelial cells by the LF-33 peptide. HEC-1 and HT-29 cells were incubated with hLF (20 µg or 256 nM) or LF-33 peptide (20 µg or 5 µM) for 30 min at 4°C, washed to eliminate the hLF and peptide excess before to be incubated with fluorescent-hLF (20 µg) for 1 h at 4°C and analysed by flow cytometry. Histograms depict the mean ± SD of binding (%) and mean fluorescences calculated on M2 gate obtained from 3 independent experiments. Binding inhibition of HIV-1 to epithelial cells by hLF and LF-33 peptide. HEC-1 (A and C) and HT-29 (B and D) cells (106 cells) were incubated with HIV-1JR-CSF and HIV-1NDK particles (5 ng/ml of p24 antigen) for 1 h at 37°C. After washes, adsorbed virus was treated by Triton and p24 antigen was measured by ELISA. Cells were pre-incubated with hLF (A and B), LF-33 peptide (C and D) or an irrelevant peptide control (not shown) for 30 min at room temperature before virus addition. Results are represented as percentage of the control (performed without pre-incubation of cells with hLF or LF-33 peptide), and corresponds to the mean ± SD from 3 independent experiments. In experimentations, 10 µg/ml of hLF and LF-33 peptide corresponded to 128 nM and 2.5 µM, respectively. Phenotypic characterization of iDC by flow cytométrie. Six days old cultured iDC were incubated with FITC/PE-conjugated antibodies or matched isotypes for 30 min at 4°C before PFA 1% fixation and FACScalibur analysis. Data are from a typical experiment representative of 4 independent experiments. Inhibition of HIV-1 transfer from iDC to CD4 T lymphocytes by hLF, not LF-33 peptide. (A) hLF binding to iDC. Cells (106 cells) were incubated with Oregon-conjugated hLF (10 and 30 µg, e.g. 128 and 384 nM) for 1 h at 4°C and analysed by FACScalibur. Data are from a typical experiment representative of four independent experiments. Histograms depict the mean ± SD of binding (%) and mean fluorescences obtained from 4 independent experiments. (B) Effect of hLF on HIV transfer from iDC to CD4 T lymphocytes. iDC were incubated or not with purified hLF (30 and 100 µg, e.g. 384 and 1280 nM) before addition of HIV-1 for 1 h. Cells were washed and cocultured for 3 days with autologous CD4 T lymphocytes. HIV p24 antigen was measured in supernatants by ELISA at day 3. Results are represented as percentage of the control (performed without pre-incubation of cells with hLF), and is the mean of transfer ± SD from 3 independent experiments. (C) Effect of LF-33 peptide on HIV-1 attachment to iDC. iDC were incubated with virus (5 ng/ml of p24 antigen of HIV-1JR-CSF and HIV-1NDK) for 1 h at 37°C. After several washes, cells were lysed and HIV p24 antigen was measured by ELISA. Cells were pre-incubated with the LF-33 peptide at 30 µg and 100 µg/ml (e.g. 7.5 µM and 25 µM) for 30 min at room temperature before virus addition. Results are represented as percentage of the control (performed without pre-incubation of cells with LF-33 peptide), and is the mean of binding ± SD from 3 independent experiments.As negative control, an irrelevant peptide was used instead LF-33 (not shown). (D) Effect of LF-33 peptide on HIV transfer from iDC to T cells. iDC were incubated with virus (5 ng/ml of p24 antigen of HIV-1JR-CSF and HIV-1NDK) for 1 h at 37°C. After several washes, IL-2-stimulated T cells were added to iDC and co-cultured for 72 h before p24 antigen measurement.As assessed by binding inhibition experiment, iDC were pre-incubated with the LF-33 peptide at 30 µg and 100 µg/ml (e.g. 7.5 µM and 25 µM) for 30 min at room temperature before virus addition. Results are represented as percentage of the control (performed without pre-incubation of cells with LF-33 peptide), and is the mean of transfer ± SD from 3 independent experiments. As negative control, an irrelevant peptide was used instead LF-33 (not shown). (E) Binding of LF to DC-SIGN. DC-SIGN “342-371” peptide was adsorbed (10 µg/ml) overnight at 4°C. Wells of ELISA plate were satured using PBS/1% powder milk for 2 h at 37°C before addition of purified hLF at 100 µg/ml overnight at 4°C. The fixed hLF was detected by peroxydase-conjugated polyclonal antibody to hLF (1 µg/ml). As a control, the same experiment was performed in parallel without DC-SIGN “342-371” peptide adsorption. The HT-29 and HEC-1 cells were incubated with hLF conjugated to the Oregon Green 488 fluorochrome (10 µg and 30 µg), fixed and analysed by flow cytometry. The hLF binding to HEC-1 cells was at 17% (MFI 56) and 30% (MFI 70) when used at 10 µg and 30 µg, respectively. The hLF binding to the HT-29 cells was at 82% (MFI 27) and at 96% (MFI 50) when used at 10 µg and 30 µg/ml, respectively (Fig. 1B, C). In order to evaluate whether the exposed LF-33 domain may be involved in hLF attachment to cells, competition experiments between fluorescent hLF and unconjugated-fluorochrome (used as control) or LF-33 peptide were carried out. The epithelial cells were pre-incubated with LF-33 peptide (or the cold lactoferrin), then washed and incubated with the fluorescent hLF. Attachment of hLF was determined by flow cytometry. Results of these experiments were analysed at two levels, according to the affinity of LF binding on epithelial cells. Thus, M1 gate allowed to estimate all cells binding hLF, while M2 gate was specific of the cells binding hLF with high affinity (stronger signal) (Fig. 2). M1 and M2 gates were defined function of the fluorescent hLF alone control dot. As expected, a decrease of conjugated hLF attachment was observed when cells were pre-incubated with cold LF (Fig. 2). Interestingly, the competition with LF-33 peptide experiment revealed an inhibition of hLF binding on HEC-1 and HT-29. Indeed, pre-incubation of the peptide was associated with a decreased total hLF binding, from 50% to 40% on HEC-1 cells, and from 43% to 17% on HT-29 cells (Fig. 2). The competitor effect of LF-33 peptide were mainly observed on cell binding hLf with high affinity (Gate M2), since there was decrease from 10% to 3%, and from 33% to 4% of the LF binding on HEC-1 and HT-29, respectively. 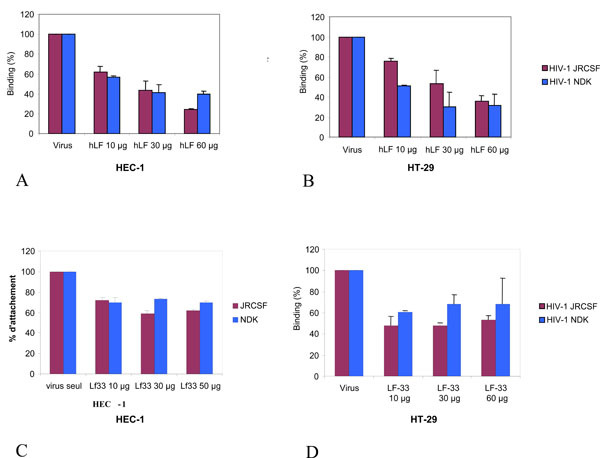 Moreover, LF-33 peptide inhibited more efficiently the hLF binding on HT-29 than HEC-1 (Fig. 2). These results indicate that the LF-33 peptide binds on epithelial cells with a high affinity, and also on hLF cell membrane receptors. We further investigated whether hLF and LF-33 peptide were able to inhibit the attachment of free R5-tropic HIV-1JR-CSF and X4-tropic HIV-1NDK particles to HT-29 and HEC-1 epithelial cells. Cells were incubated with viruses in the presence of hLF and LF-33 peptide for 1 h at 37°C. Under these experimental conditions, we assume that internalisation of HIV particles via alternative receptor in CD4-negative epithelial cells can be considered as negligible. Cells were then washed and HIV-1 p24 antigen was measured. Pre-incubation of cells with human LF at 10 µg, 30 µg and 60 µg, leads to a decrease of 38%, 56% and 76% of the attachment of HIV-1JR-CSF (non parametric Friedman’s test for three paired groups; p<0.01) and of 43%, 58% and 60% of the attachment of HIV-1NDK (p<0.03), on HEC-1 cells (Fig. 3A), respectively; and of 24%, 47% and 64% of the attachment of HIV-1JR-CSF (p<0.01), and of 49%, 70% and 68% of the attachment of HIV-1NDK (p<0.02), on HT-29 cells (Fig. 3B). Irrelevant peptide control used instead LF-33 showed not effect on virus attachment (not shown). The LF-33 peptide exhibited a lower inhibitory effect on HIV-1 attachment to epithelial cells as compared to hLF. Indeed, the observed reductions of HIV-1JR-CSF binding on HEC-1 cells at 10 µg, 30 µg and 60 µg of LF-33 peptide were 28%, 41% and 38% (p<0.04), respectively, and those of HIV-1NDK bound on HEC-1 cells were 30%, 27% and 30% (p<0.05), respectively (Fig. 3C). The decreases of HIV-1JR-CSF attachment to HT-29 cells at 10 µg, 30 µg and 60 µg of LF-33 peptide were of 52%, 52% and 47% (p<0.04), respectively, and those of HIV-1NDK attachment on HEC-1 cells were 39%, 32% and 31% (p<0.05), respectively (Fig. 3D). The dendritic cells used in all experiments presented an immature phenotype as demonstrated by the low expression of CD83 and the high expression of CD86 and CD1a; the iDC expressed also CD4 (70%), CXCR4 (22%), CCR5 (10%) and DC-SIGN at 85% (Fig. 4). The incubation of iDC with hLF and LF-33 had no effect on the immature phenotype (data not shown). The Oregon-conjugated hLF used at 10 µg and 30 µg linked, in a dose-dependent manner, to iDC at 21 and 32%, respectively (Fig. 5A). The effect of hLF and LF-33 on the transfer of HIV-1 from iDC to autologous CD4 T lymphocytes was further investigated. Dendritic cells were incubated with HIV-1 and hLF or LF-33 peptide before washing and addition of IL2-activated T lymphocytes (1/5 ratio). Measurement of HIV-1 p24 antigen released at 72 h in the co-culture supernatant showed that at 30 µg and 100 µg, the percentages of HIV-1JR-CSF transfer by hLF were decreased by 56% and 61% (non parametric Wilcoxon signed-rank; p<0.01), respectively (Fig. 5B); and those of HIV-1NDK transfer were 44% and 64% (p<0.01), respectively (Fig. 5B). No inhibitory effect was observed when the LF-33 peptide was used. Unexpectedly, the incubation with the LF-33 peptide enhanced 3 to 6 fold the HIV-1 transfer from iDC to autologous CD4 T cells (p<0.01 for HIV-1JR-CSF and p <0.02 for HIV-1NDK), as shown in Fig. (5D), likely because the peptide increased the HIV-1 attachment to iDC (p<0.02 for HIV-1JR-CSF and p <0.03 for HIV-1NDK), as demonstrated by binding inhibition experiments (Fig. 5C). Irrelevant peptide control used instead LF-33 showed not effect on virus attachment to iDC nor on virus transfer from iDC to T cells (not shown). Finally, the interactions between hLF and DC-SIGN molecule were assessed by indirect ELISA using for coating the synthetic peptide «DC-SIGN 342-371» corresponding to CRD domain of DC-SIGN interacting with HIV-1 gp120. The ELISA optical densities were 1.36 in the presence of DC-SIGN peptide, and only 0.03 in its absence (Fig. 5E), demonstrating that hLF binds to the DC-SIGN peptide. In the present study, purified hLF inhibited the attachment of free HIV-1 to epithelial cells. Indeed, hLF inhibited as much as 90% of the attachment of X4- and R5- tropic primary HIV-1 to human endometrial HEC-1 and colorectal epithelial HT29 cell lines. In addition, the effect of hLF on viral attachment on epithelial cells is likely mediated by the exposed domain LF-33. Indeed, the peptide LF-33 also inhibited significantly the attachment of primary X4- and R5- tropic HIV-1 to HEC-1 and HT-29 epithelial cells. Taken together, these findings demonstrate that the inhibitory effect of hLF on HIV attachment on epithelial cells previously reported by Saïdi and colleagues  is associated with the external domain LF-33 peptide. We further evaluated the ability of hLF to inhibit the transfer in trans of HIV-1 from iDC to CD4 T lymphocytes, which constitute one of the major steps of the rapid dissemination of HIV-1 from mucosa to lymphoid tissues . In our hands, purified hLF inhibited up to 60% the virus transfer to CD4 T lymphocytes, whereas no inhibitory effect could be observed when using the LF-33 peptide. By comparison, the most neutralizing monoclonal antibody to gp120, IgGb12, induced up to 90% HIV-1 inhibition . By contrast to hLF, the LF-33 peptide enhanced HIV-1 transfer from iDC to autologous CD4 T cells. These results suggest that the LF-33 exposed domain is not involved in hLF-associated inhibition of HIV-1 transfer to CD4 T lymphocytes. Since hLF binds to DC-SIGN, one can hypothesize that hLF could block the virus transfer to lymphocytes by hampering the iDC-PBL interaction. One can also speculate that LF-33 increases HIV-1 transfer to CD4 T lymphocytes by enhancing the virus binding to iDC. We showed that Oregon fluorescence-conjugated hLF was able to bind to epithelial cells in a dose-dependent manner reaching 40% of positive cells. The mechanisms by which hLF interacts with CD4-negative epithelial cells remains speculative. However, although both CD4 and coreceptors are essential for HIV-1 entry process, the initial association of HIV-1 particles to cells could occur in the absence of these receptors. Several observations pointed out that the attachment of HIV-1 particles to the cell surface occurs through interactions with heparan-sulfate proteoglycans and with the cell surface-expressed nucleolin [14-16], suggesting their possible involvement in HIV-1 attachment inhibition on epithelial cells by hLF. Thus, LF likely could exert its effect at the level of viral adsorption or penetration, in accordance with its highest effectiveness when administered before or simultaneous with the viral inoculum, as it occurs in vivo during breastfeeding and sexual transmission of HIV-1 . The role of hLF in HIV-1 mucosal transmission remains unknown. The amounts of hLF used in our study (30 and 100 µg/ml) were largely below physiological concentrations, suggesting that the blocking properties of hLF on HIV-1 attachment, replication or transfer in trans, could likely modulate the efficiency of HIV acquisition through mucosal routes. However, reported observations about hLF levels in saliva and breast milk from HIV-1-infected individuals remain conflicting. Thus, both increases [17-19] and decreases [20, 21] in LF levels were reported. Although a linear correlation between low LF serum levels in HIV-infected pregnant women and perinatal transmission of HIV-1 to the neonate has been reported , no correlation could be found between the level of breast milk hLF in HIV-infected breastfeeding mothers and the transmission of virus to their children . Finally, the presence of natural antibodies to hLF present in mucosal secretions may modulate the HIV-inhibitory activity of hLF . Taken together, our observations demonstrate that hLF may interfere with HIV-1 mucosal transmission by blocking virus attachment to epithelial cells and by inhibiting virus transfer from iDC to CD4 T lymphocytes, two crucial steps of HIV dissemination from mucosae to lymphoid tissue. The differential effects of the LF-33 peptide on HIV attachment and HIV transfer suggest that hLF-mediated inhibition of early steps of HIV mucosal crossing may use two different pathways. This work was supported by Agence Nationale de Recherches sur le SIDA et les Hépatites Virales (ANRS), France. Legrand D, Pierce A, Elass E, Carpentier M, Mariller C, Mazurier J. Lactoferrin structure and functions Adv Exp Med Biol 2008; 606: 163-94. Zhang GH, Mann DM, Tsai CM. Neutralization of endotoxin in vitro and in vivo by a human lactoferrin-derived peptide Infect Immun 1999; 67(3): 1353-8. Harmsen MC, Swart PJ, de Bethune MP, et al. Antiviral effects of plasma and milk proteins: lactoferrin shows potent activity against both human immunodeficiency virus and human cytomegalovirus replication in vitro [see comments] J Infect Dis 1995; 172(2): 380-8. Hasegawa K, Motsuchi W, Tanaka S, Dosako S. Inhibition with lactoferrin of in vitro infection with human herpes virus Jpn J Med Sci Biol 1994; 47(2): 73-85. Ikeda M, Nozaki A, Sugiyama K, et al. Characterization of antiviral activity of lactoferrin against hepatitis C virus infection in human cultured cells Virus Res 2000; 66(1): 51-63. Puddu P, Borghi P, Gessani S, Valenti P, Belardelli F, Seganti L. Antiviral effect of bovine lactoferrin saturated with metal ions on early steps of human immunodeficiency virus type 1 infection Int J Biochem Cell Biol 1998; 30(9): 1055-62. Berkhout B, van Wamel JL, Beljaars L, Meijer DK, Visser S, Floris R. Characterization of the anti-HIV effects of native lactoferrin and other milk proteins and protein-derived peptides Antiviral Res 2002; 55(2): 341-55. Kozlowski PA, Neutra MR. The role of mucosal immunity in prevention of HIV transmission Curr Mol Med 2003; 3(3): 217-8. Izquierdo-Useros N, Blanco J, Erkizia I, et al. Maturation of blood-derived dendritic cells enhances human immunodeficiency virus type 1 capture and transmission J Virol 2007; 81(14): 7559-0. Saidi H, Eslahpazir J, Carbonneil C, et al. Differential modulation of human lactoferrin activity against both R5 and X4-HIV-1 adsorption on epithelial cells and dendritic cells by natural antibodies J Immunol 2006; 177(8): 5540-9. Groot F, Geijtenbeek TB, Sanders RW, et al. Lactoferrin prevents dendritic cell-mediated human immunodeficiency virus type 1 transmission by blocking the DC-SIGN--gp120 interaction J Virol 2005; 79(5): 3009-15. Moris A, Pajot A, Blanchet F, Guivel-Benhassine F, Salcedo M, Schwartz O. Dendritic cells and HIV-specific CD4+ T cells: HIV antigen presentation, T-cell activation, and viral transfer Blood 2006; 108(5): 1643-51. Binley JM, Wrin T, Korber B, et al. Comprehensive cross-clade neutralization analysis of a panel of anti-human immunodeficiency virus type 1 monoclonal antibodies J Virol 2004; 78(23): 13232-52. Said EA, Courty J, Svab J, Delbe J, Krust B, Hovanessian AG. Pleiotrophin inhibits HIV infection by binding the cell surface-expressed nucleolin FEBS J 2005; 272(18): 4646-59. Hovanessian AG. Midkine, a cytokine that inhibits HIV infection by binding to the cell surface expressed nucleolin Cell Res 2006; 16(2): 174-81. Legrand D, Vigie K, Said EA, et al. Surface nucleolin participates in both the binding and endocytosis of lactoferrin in target cells Eur J Biochem 2004; 271(2): 303-17. Baynes RD, Bezwoda WR. Lactoferrin and the inflammatory response Adv Exp Med Biol 1994; 357: 33-41. Becquart P, Hocini H, Levy M, Sepou A, Kazatchkine MD, Belec L. Secretory anti-human immunodeficiency virus (HIV) antibodies in colostrum and breast milk are not a major determinant of the protection of early postnatal transmission of HIV J Infect Dis 2000; 181(2): 532-9. Mandel ID, Barr CE, Turgeon L. Longitudinal study of parotid saliva in HIV-1 infection J Oral Pathol Med 1992; 21(5): 209-13. Defer MC, Dugas B, Picard O, Damais C. Impairment of circulating lactoferrin in HIV-1 infection Cell Mol Biol (Noisy-le-grand) 1995; 41(3): 417-21. Muller F, Holberg-Petersen M, Rollag H, Degre M, Brandtzaeg P, Froland SS. Nonspecific oral immunity in individuals with HIV infection J Acquir Immune Defic Syndr 1992; 5(1): 46-51. Semba R, Ed. Nutritional interventions: vitamin A and breastfeeding In: IIIrd International symposium: global strategies to prevent perinatal HIV-1 transmission; Valencia. 1998.